Governor Rick Scott appointed Jim Poppell Secretary of the Florida Lottery on July 10, 2017. Mr. Poppell previously served as the Chief of Staff of the Florida Department of Economic Opportunity, where he was responsible for representing the agency's views on policy decisions and ensuring its mission and goals were achieved by managing the day-to-day operations of each of its divisions. 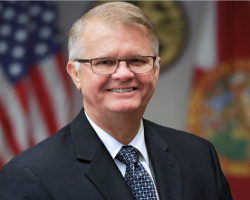 Prior to his career in state government, he served as Executive Vice President of Human Resources at NextEra Energy, Inc., held several leadership positions at Florida Power & Light Company and was a litigator with Foley & Lardner LLP. He received his Juris Doctor from the University of Missouri, his Master of Arts in Spiritual Formation and Leadership from Spring Arbor University in Michigan and his Bachelor of Arts in History from Eckerd College. "The Florida Lottery is committed to improving opportunities for Florida's students by maximizing education contributions. Students who benefit from a good education will go on to contribute greatly to Florida's economy once they enter the workforce," said Secretary Poppell. Mr. Poppell resides in Tallahassee with his wife, Jeanette. Together they have three adult children.